La Terrasse at the VICTORIA-JUNGFRAU Grand Hotel & Spa features inspired French cuisine by Chef de Cuisine Michael Wehrle. The VICTORIA-JUNGFRAU Grand Hotel & Spa is an elegant grand dame, and as would be fitting, their French restaurant, La Terrasse, perfectly complements the elegance and style of the hotel. The dining room is gorgeous; crystal chandeliers sparkle throughout the restaurant, yellow-apricot marble columns add stateliness, and the diagonally cut marble floor in black, white, and yellow-apricot provides a cohesive appeal. Black and gold chairs covered with mint green, pink, yellow, and blue striped fabric surround tables formally draped with white linens and adorned with fresh flowers. Palm trees, walls of windows that afford guests with views of the majestic alpine mountain, Jungfrau, and tall gold tapers burning in gold angel candlestick holders complete the ambience of more than 140 years of tradition and hospitality. Edward F. Nesta and I stayed at the VICTORIA-JUNGFRAU Grand Hotel & Spa in October 2006, and had a memorable dinner at the 16 GaultMillau points restaurant, La Terrasse, where Chef de Cuisine Michael Wehrle showcases his creative culinary style. Our servers Sven and Jochen began our evening with a champagne aperitif to accompany the Amuse Bouche of "spume" of corn presented in a shot glass and garnished with a piece of popcorn, yellow fin tuna with guacamole, and coconut crust chicken on a bed of tomato relish. 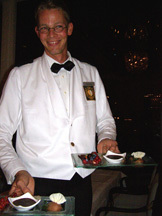 For his first course, Edward selected the Foie Gras with balsamic, cherries, and a butter twist. The foie gras was presented as a generous portion of foie gras in a rich balsamic sauce flavored with an abundance of sweet cooked cherries. I selected the Champignons Bödeli frits, concombres, oiselle (Baked Bödeli Mushrooms with cucumbers and sorrel) that was a mixture of lightly coated, seasoned, and baked delectable wild mushrooms presented on a black plate. Edward continued with a second course of Selle de Boeuf avec chicorée, petits oignons et pommes de terre (Saddle of beef with chicory, pearl onions and potatoes) paired with a 2002 Monte de Castanheiro, Quinta do Zambujeiro, Portugal. The beef was presented on a bed of chicory with bacon wrapped leeks, new potatoes, pearl onions, and diced vegetables. The wine was made with a blend of Trincadeira and Castelao grapes, had 13% alcohol, exhibited a deep red color, a rich fruit nose, medium body, and had cherries and dried fruits on the palate. For my second course, I had Flétan avec purée de haricots blanche, tomates et cresson de fontaine (Halibut with white bean puree, tomatoes and watercress) paired with a 2002 Chablis 1er Cru Montmain, from Domaine Louis Michel & Fils, France. This dish was presented with piped bean puree surrounding two halibut filets on a bed of stewed tomatoes with watercress garnishes. The wine made with 100% Chardonnay grapes and fermented and aged in stainless steel tanks, had 12.5% alcohol, exhibited a light gold color, an aromatic citrus and floral nose, with fresh green apple, citrus and mineral notes on the palate. We ended our dinner on a delightfully sweet note with a dessert course of chocolate sorbet garnished with a white chocolate fan, a chocolate brûlee, and a delightful medley of fresh, ripe currents, blueberries and raspberries, and was garnished with chocolate leaves. Of course, we sampled the petit fours, chocolate fudge, macaroons, and miniature tarts that followed on a silver tiered tray. When in Switzerland how we could we pass up any dessert made with the famous Swiss chocolate? Read Chefs' Recipes (in English and in German) for recipes from Executive Chef Manfred Roth and an interview with Chef de Cuisine Michael Wehrle. Read other articles on the VICTORIA-JUNGFRAU Grand Hotel & Spa and their other restaurants, Jungfrau-Brasserie and La Pastateca, in the Destinations, Hotels and Resorts, Restaurants, Adventures, Chefs' Recipes and Spas sections. The VICTORIA-JUNGFRAU Grand Hotel & Spa is part of the VICTORIA-JUNGFRAU Collection, www.Victoria-Jungfrau-Collection.ch.